Additional news that I was hoping to make it into yesterday’s Odds and Ends post (but was delayed due to periodontistry): Gabriel Vilardi, Jaret Anderson-Dolan and Matt Villalta were named last week to Canada’s roster for the annual World Juniors Summer Showcase, which will be held in Kamloops, B.C. from July 28 to August 4. This round robin tournament serves as an early development camp used by Canada, the United States, Finland and Sweden as a preliminary evaluating tool in constructing its roster for the annual IIHF World Junior Championships. There is also an *actual* World Junior camp in the immediate lead-up to the tournament, which will be held in Vancouver and Victoria from December 26 to January 5. The news also follows Mikey Anderson’s inclusion on the United States’ summer showcase roster last month. Anderson, who is entering his 19-year-old sophomore season as a defending champion at Minnesota-Duluth, had one assist in seven games en route to a bronze medal last year and will be a likely target to take on some additional work at this year’s tournament. 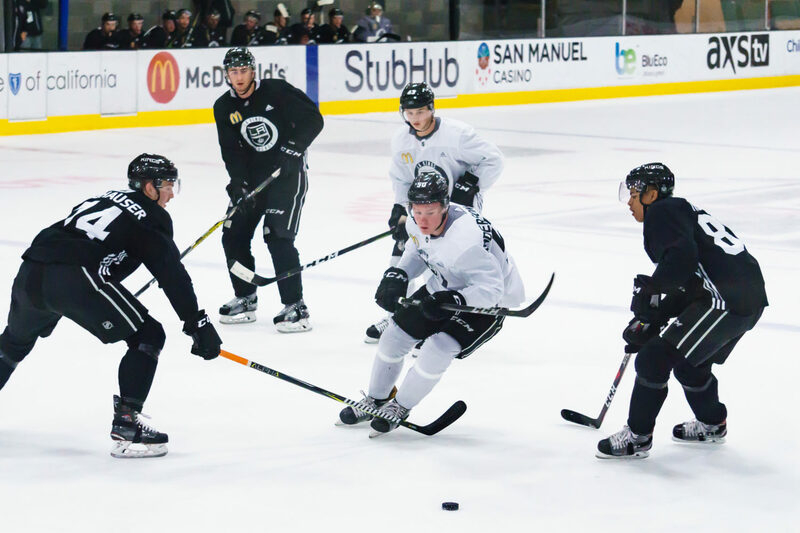 With Vilardi, Anderson-Dolan, Villalta and Anderson taking part, the Kings’ first four picks from the 2017 draft all have received invites to the summer showcase. 1998-born Cole Hults, selected in the fifth round in 2017 and a late cut last December for the United States’ team, has aged out of tournament consideration but will return to Penn State for his sophomore season this fall. Rasmus Kupari, who appeared in five WJC games last winter, will be expected to make Finland’s team (and Finland’s summer showcase camp). If Vilardi is made available for Team Canada, he’ll be a lock if healthy. Being “made available” is an iffy bet, though, because he’s only eligible to play in the NHL or be returned to the OHL. If he plays in the NHL – and the Kings will give him a clear, strong opportunity to make the team – it’s not probable that they would release him to play in world juniors. If he’s returned to Kingston, then he’s an easy bet to log first line minutes as one of the tournament’s most hyped players. One of 24 forwards named to the preliminary roster, Anderson-Dolan is an interesting case study. Of those 24 forwards, 11 are first round draft picks. An early second round pick in 2017, Anderson-Dolan is a versatile player capable of adhering to a mesh of speed and checking responsibilities and therefore fits a useful type of a role on a team littered with highly skilled star players up front. From a preliminary glance, he looks to be one of Canada’s bubble players, but coming off a 40-goal season and with the type of responsible, all-situational credentials that he possesses, is probably penciled just inside the bubble prior to the late-summer work he’ll get in. Speaking with Anderson-Dolan at development camp, he already has his sights set on the summer showcase, which he has begun preparing for in earnest. With the graduation of goalie Carter Hart to the pro game, Canada’s goaltending competition looks to be a wide-open race. Four goalies were invited to the summer showcase – three 1999-borns in Villalta (2017 / LAK 3), Michael DiPietro (2017 / VAN 3) and Matthew Welsh (undrafted; 2019 eligible), and a 2000-born in Olivier Rodrigue (2018 / EDM 2). None are WJC returnees. Goaltending statistics east of Manitoba were wonky this year, with the mean save percentage in the OHL and QMJHL down from the WHL’s average rate. Only two clear-cut starting goalies in the OHL last season posted save percentages better than .910, and both were newly graduated 20-year-olds in Justin Fazio and Jeremy Helvig. In other words, this isn’t exactly the worst year for Villalta to be right in the thick of competition for a spot on a potential tournament favorite. Canada will be coached by Tim Hunter of WHL-Moose Jaw.